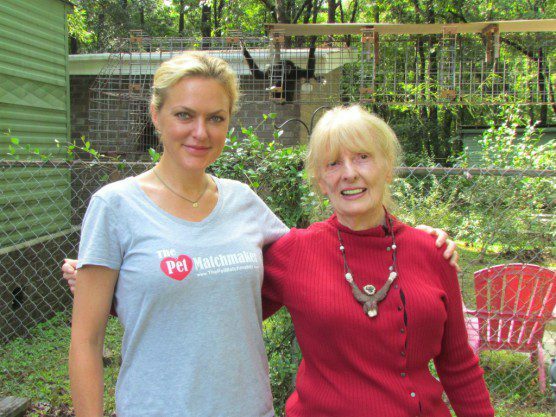 Over the weekend we were delighted to welcome not one, but two bona fide Hollywood actors to the IPPL sanctuary. Actress and animal activist Elaine Hendrix arrived yesterday with her boyfriend and fellow-actor Salvator Xuereb, as well as his young daughter Anouk and son Finnley, as the four of them were in the midst of a family roadtrip. 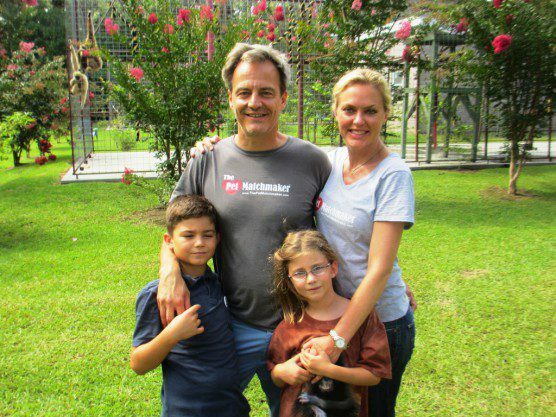 Actress and animal activist Elaine Hendrix (right), with her boyfriend and fellow-actor Salvator Xuereb, his son Finnley, and daughter Anouk, came for a visit to the IPPL sanctuary. Gibbons Glenda and Gary did their best to photobomb the pic. Elaine had met IPPL’s Shirley McGreal at the Animal Rights National Conference in Los Angeles last month, where Elaine was hosting a benefit auction. She was excited to learn that our gibbon sanctuary is located so close to where her mother lives, so she asked if she and her traveling companions could swing by. Elaine not only has an impressive list of over 100 film, TV, and other acting credits to her name (including the popular movie The Parent Trap and more recently a stint with Charlie Sheen in the FX series “Anger Management”), she is also passionate about animals. “My heart’s mission is animal rights,” she told me earlier today, but she works on all kinds of animal-related issues—welfare, rescue, conservation, you name it. Basically, “my issue is anything that keeps animals from harm!” she said. Shirley took Elaine and her friends on a tour of the sanctuary; here, they stop by Igor’s house. At the time she had a car with leather seats; she got rid of it. She also tossed out every product that was tested on animals. She was already vegetarian, but she has since adopted a vegan lifestyle. She founded The Pet Matchmaker (an organization dedicated to helping place homeless pets) and writes a “Stages & Cages” blog, where she shares stories of her pro-animal activities (and where you can read about her take on her visit to IPPL!). During their visit, Salvator helpfully took many photos and even filmed Elaine’s interview with Shirley, with an actor’s attention to detail regarding sound quality and ambient lighting; they’ll be posting the footage on Elaine’s blog soon. 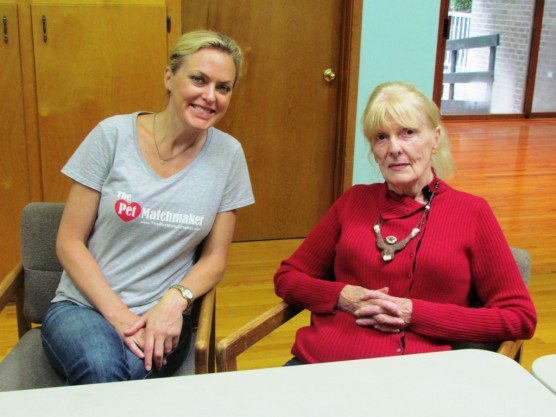 Shirley was interviewed by Elaine for her blog on www.ThePetMatchmaker.com, a Web site that helps unite pets with prospective owners. She and IPPL are, in fact, already connected via her rescue work. She was part of the team that liberated 55 long-tailed macaques (as well as 118 beagles) from a New Jersey lab that was being shuttered in 2010.  She helped get eight of the monkeys to Mindy’s Memory primate sanctuary in Oklahoma, and IPPL helped foot the bill for the animals’ initial rehabilitation. But she has a gentle touch. “I never preach,” she told me. “I just say, ‘Oh, you have a dog?’ and the conversational floodgates open wide!” She likes to give out the booklets on cruelty-free products to her hair and makeup people as gifts—although, she remarked, the first question from hair and makeup people is usually “what products do you like and not like;” lately, when she asks for cruelty-free products, she usually gets a number of options to choose from. 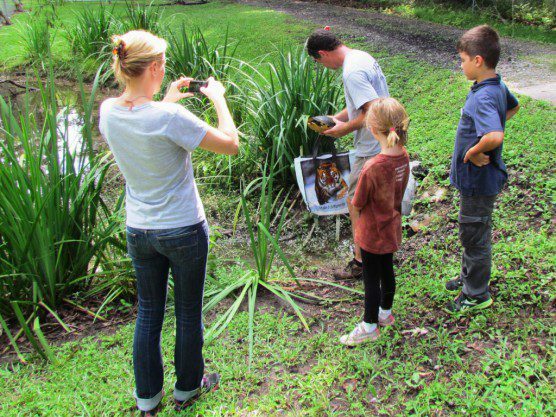 IPPL staff member Hardy Brown sets a rescued yellow-bellied slider into our pond; Elaine films the release as children Anouk (left) and Finnley look on. And the children? By the end of the visit the kids were ready to join the IPPL staff. When Finnley was asked if he wanted to start a sanctuary of his own, he said, no, he’d just come to work at IPPL. 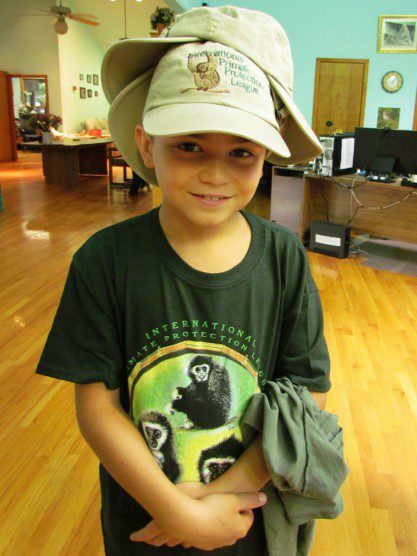 Finnley Xuereb, a boy of many hats (four), already knows he wants to work at IPPL when he grows up.